The Long Version: I made two mistakes when I bought the Innate Heliograph camera case. The second was that I didn't pay attention as it was being scanned at the register; the first was thinking "how much could a compact camera case possibly cost?" when I found it on an unmarked peg at Mountain Co-op. Boy howdly, let me tell you, I'm not going to do that again. At $50 retail, this little thing costs double or triple what most pouches do, and is one-sixth the price of that god among shoulder bags, the Billingham Hadley Pro. I bought the Heliograph case because it manages to hold my Ricoh GRDIV with the optical viewfinder attached. On retroactively seeing just how much it had cost I set the case aside, along with the receipt, intending to return it to the store. Somehow it just never made the trip back, and now I'm glad that it didn't. The unique selling point of the Innate Heliograph is that it's made from a rubberized fabric with welded seams and a shielded zipper, making it weatherproof without needing a rain cover or any additional precautions. It lacks a belt loop, but it comes with a shoulder strap and has a rugged attachment point for a biner clip. The pouch also has a rather clever strap attachment method, which makes the strap both removable and secure without needing bulky hardware. Inside the case is a removable padded pocket to hold the camera, which is stitched with a battery-sized sub-pocket that I didn't even try to use. While the interior is just about big enough to house my Girdiv, the stiff and boxy zippered opening makes its insertion and retrieval difficult enough without the added challenge of additional contents. 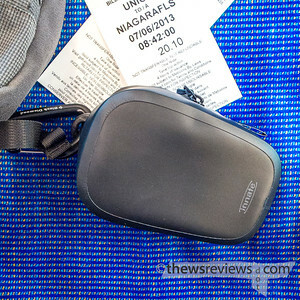 But as a larger-than-average case it should work very well with sensibly-sized cameras, and even the Panasonic LX7 and Canon G15 can fit without too much difficulty. 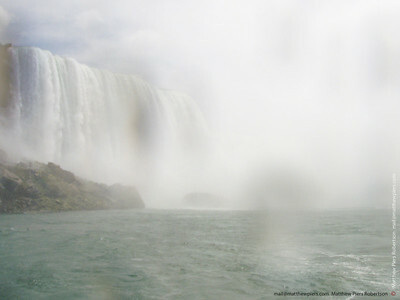 I'm not someone who typically needs a rugged and outdoorsy camera case, but a trip to Niagara Falls meant that I wanted better photos than my two waterproof jpeg cameras could manage, and a ride on the Maid of the Mist tourist boat meant that my dry-weather camera couldn't be too big. After longingly looking at the massive impracticality of carrying my D800, I finally separated my Heliograph case from its packaging and put it to use. I prefer to carry compact cameras in protective sleeves inside of other bags, so this is actually my first time using an external pouch. I did carry it inside my MEC Pod for the trip to and from Niagara Falls, but it was clipped its strap the rest of the time. This actually worked very well – as opposed to a belt loop – leaving the case free to move as required, making both carriage and access much easier. 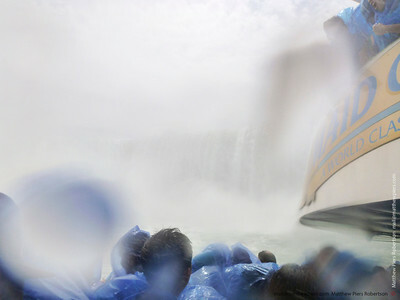 A ride on the Maid of the Mist is like fast-forwarding through a temperamental storm. At times the airborne water is a persistent fog, and other times it comes down as heavy streaking rain. The wind is something else, gusting and eddying and taking water everywhere. I've certainly seen harder rainstorms, and the time near the falls only lasts a few minutes, but it's a soaking that's impossible to shelter from. Having the Heliograph case meant that I was able to use my superior Ricoh on the approach to the Falls and only put it away when keeping it out was risking its safety. 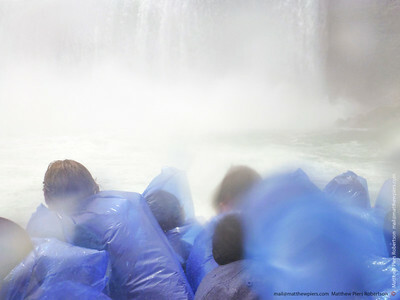 The case was at my side, outside of my iconic blue poncho, where it stayed throughout the ride. These action photos were taken with the waterproof cameras – first from the Olympus 770SW, second two via the Panasonic TS3 – and give some idea what the Heliograph went through. 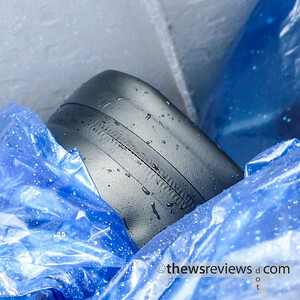 Inserting and removing the camera isn't as easy as it would be with a nice soft Lowepro pouch, but it's much easier than using a roll-top drybag. The storm-covered zipper is a bit harder to open and close than an unprotected one, but it's no challenge at all compared to the zippers that are impervious even without the rubberized shield. All told the case strikes an appropriate balance of compromises. There are times when waterproof storage is vital. Years ago I brought my then-new $1000 Sony F828 to photograph a 5K run, which happened to include a torrential downpour around the half-way mark. Being prepared, I wrapped the big camera in a couple of plastic shopping bags, put it in the bottom of my weather-covered backpack, and kept going with a compact Canon in a diving case. Hours later I pulled the Sony out of its soaked-through nest to find it sitting in an inch of water that had been trapped in my makeshift protection. Formative experiences have long echoes, and drenching my first 'serious' camera was a big reason why I prioritized a weatherproof SLR system when it came time to make that jump. These days I'm not quite as eager to be out photographing in the pouring rain, but the Heliograph case will give me a lot more confidence to carry my impending Ricoh GR – when it finally arrives – as an SLR-quality camera that I can safely transport from awning to awning. That, ultimately, is why I never quite brought myself to take the Innate case back to the store: waterproof protection is going to become much more important once the value of the camera that it carries doubles. 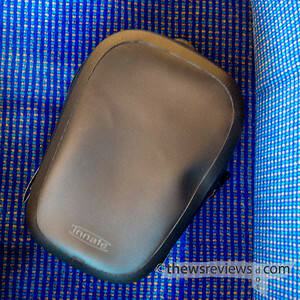 This camera case certainly comes at an impressive cost, but it also does an impressive job. I wouldn't hesitate to leave it exposed to conditions that would likely destroy its contents, freeing up space inside my main bag and keeping the camera handy for the nice after-storm light. I wouldn't have bought it if I had seen its price on the store peg, but then I already would have missed a lot of the photos that it enables. As with everything, there are compromises to be made. Searching for the equivalent case to carry my Nikon1V1 with kit zoom...failing that, with 10/2.8? I had trouble carrying my LX5 Pany with electronic view finder mounted. I don't have that camera any more. You find the most intriguing stuff. AND I had better luck with my Sony F828, which was my first serious digital camera too. It made many a trip with me. I've been looking around, and have only come up with the MEC Aegir. It's the submersible-waterproof version of their iconic "Pod" sling, and given the weather this summer, I'm putting one on my shopping list. Add some impromptu padding – a two-dollar Walmart hand towel or a spare toque – and it should have no problem with a mirrorless system. I should note that my F828 did live to shoot again. It took a week to dry out, but came back almost as good as new. It now lives in Texas with Keith Alan K, who's a former F717 owner, and he's still doing good work with it. An update: I had a look at the Aegir when I was last at MEC, and one won't be joining my household. The zippered opening is just too small, and the rubberized fabric too stiff, for it to work as a camera carrier. I don't doubt that it's perfect for its intended purpose, but it can't give easy access to something as bulky, awkwardly shaped, and semi-fragile as a camera.